I so love Embankment Gardens. It makes my work day this much better to walk through the lovely flower beds and on sunny, summer days my co-workers and I munch our sandwiches on the grass and work on our tans during our lunch break. It's a hard life, you know. In addition to its aesthetically pleasing value, on any given day, you can receive free promotional items at the gates of the gardens such as: a loaf (or two) of white sliced bread, courtesy of Kingsmill (yeah, this really happened last year and I got wayyyy too excited about it) OR a Muller yogurt and granola pot OR a Starbucks bottled frappuccino OR (randomly) brie cheese. Not sure about that last one. But the gardens also boasts a bandstand, which seems to attract American high school bands on European tours every summer. If you're lucky enough, you too, can hear the strains of the "Pirates of the Caribbean" theme for the 42nd time while eating outside. What I'm interested in, however, is the photo above. 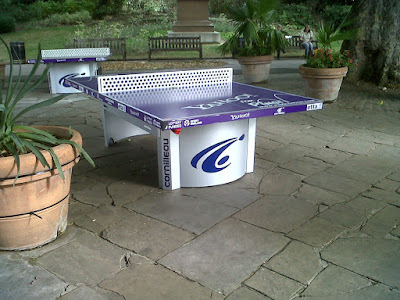 Most recently, pop-up ping pong tables have appeared in the gardens (along with 99 other locations throughout London), courtesy of PingLondon. This made me very happy. Fully equipped with paddles and balls, these tables will remain in the gardens until August 22nd and opportunities for masterclasses and competitions are also available. Isn't that something? Now, who wants to play?